I seem to remember seeing something last year about Slough getting a bike hire scheme, similar too don’s Boris bikes, and wondering how this would work in a town where the movement of the workforce was based around a fairly traditional working day. Well, this morning I stumbled across one of the three (?) bike parks about half way along the Bath Road alongside the Slough industrial estate, and I’m still not convinced. Don’t get me wrong, I think any provision that encourages less car use has to be good in principle, but consider how these bikes will be used. The bike parks, as I understand it, are at Slough and Burnham railway stations, plus the park on the Bath Road. So the vast majority of users will be train commuters, who would normally hop on a bus or walk to work – so the reduction in car use is minimal. Then consider the cycle infrastructure in Slough and the best cycle routes from those various bike parks. Slough does have good green spaces and there’s reasonable cycle path provision on the main routes, but Slough is a very busy town with lots of traffic, and the cycle provision does not appear to be particularly ‘joined up’. 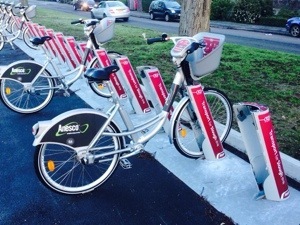 As a result I wonder whether the early costs of the Cycle Hire scheme would have been better in invested in improving cycle paths and safety, to encourage more cycle use in the local Slough community – ahead of a larger bike hire scheme with additional bike parks in more residential parts of the town. Next PostThe great sugar debate… All over the news right now, but what has traces of sugar? Beer, best bitter! !